Take a moment and look around the room you are in. How many people are on their cell phone? On a tablet? Using some sort of digital device? The world we are living in is a new frontier -- we have access to personal technology 24/7 and boy, are most of us connected. But living in a digital world is a challenge for our eyes in particular; our visual system is made to focus at both distance and near, but the resting state for most people's eyes is when they are looking in the distance (about 20 feet away). That means every time you look closer, your eyes are having to work, and that can cause all sorts of issues. Why are my eyes so strained? Think about how we use a tablet or cell phone. We hold it close (the average person holds it about 12 inches away from the face), and crane our neck down to view it. This unnatural neck bend and extremely close working distance puts a ton of strain on our body and focusing system. Think of your eyes seeing at near (reading, cell phones, anything you hold near to your face) in the same way you think of lifting weights. When you are looking up close, it is as if your eye is lifting a weight -- it is using the muscles of the focusing system to change the shape of the lens inside your eye and focus what you are seeing into a clear image. This is called accommodation. Now when you look out in the distance, your eye muscles must fully relax to let your lens return to its natural shape-- basically like putting the weight down. The closer you are holding what you are looking at, the heavier the weight is in this analogy, so you can see how cell phones and tablets are even harder on our body than traditional books or desktop computers. Luckily there are glasses specifically designed to help make this work easier for our body, and keep our eyes functioning to their maximum ability. Zeiss Digital Lenses are specifically designed for people that are under 40 (before our focusing system begins to lose its ability to see things up close clearly which is called presbyopia) that are frequent cell phone or digital device users. The lens is largely made with your usual distance prescription -- it is not a computer pair of glasses and it is not a bifocal or progressive. In the very inner and outer corners, there is a small near "boost" designed to relax some of the focusing system's effort when you are looking through it. There are no lines, and the power change happens without a progression or any peripheral distortion. That means nice, normal vision in all ranges. Schematic of the Zeiss Digital Lens via. Notice that in the bottom of the lens there are 2 little thumbprints. 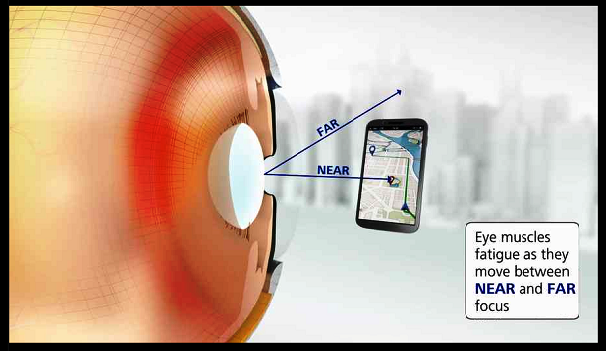 These are the near vision "boost" zones where you would look through to see your cell phone or tablet. Don't worry, they are 100% clear so you won't see them in your glasses. This diagram is just trying to illustrate that the lens is not a progressive -- there are no peripheral vision distortions and no moving your head or neck into the right place. We naturally hold our cell phone down and to one side (whichever hand you are holding it in) so the zones are positioned in the natural viewing place for hand held devices! No head or neck movement necessary. Other perks? 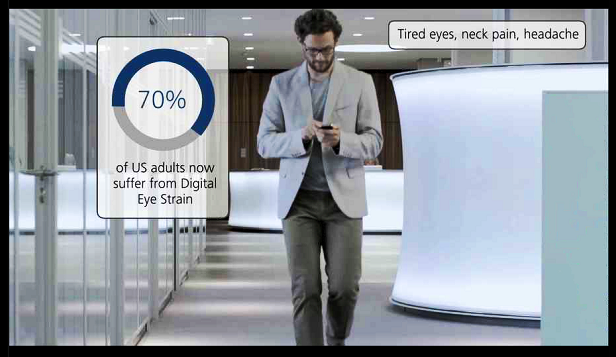 There are a lot of studies reporting about the potential issues of blue light emitted from our digital devices for our long term ocular health. Blue light appears to be linked to increased risk for blinding macular degeneration when we are older, and could be causing sleep issues (blue light resets our biological clock by telling us to stay awake!). Zeiss Digital Lenses are made with an anti-reflective coating designed to block blue light waves to the best extent on the market today without causing a tint to the lens. Are you an all day desktop computer user that gets tired eyes during your work day staring at the screen? If so, this is not the right product for you because this lens is designed to maximize your distance vision and give just a small, non-distracting window to relax your eyes for hand-held devices. Desktop computer strain is better solved with a different product all together -- either a progressive style or a separate computer only pair of glasses could work. Your doctor can help you find the right lens for you based on your needs and issues; there is no one lens for every person and every situation! My opinion: I have been wearing the Zeiss Digital Lens for a week, and it has been a completely seamless transition from my standard distance only lenses. I actually had to prove to myself there was a near boost in the lens by holding the lens up to look through that power boost area in the distance -- that's how inconspicuous it is. I have found absolutely no issues using the lens; it won't distract you, it won't mess with your peripheral or distance vision. It just gives you that little pop of relief for up close strain if you are one of the millions of Americans tied to their cell phone or tablet. If that sounds like you, these lenses would be perfect for your every day pair of glasses because they would work in all situations without any distortion or issue. Don't think of this lens as a bifocal or a progressive -- it is not for aging or old eyes. 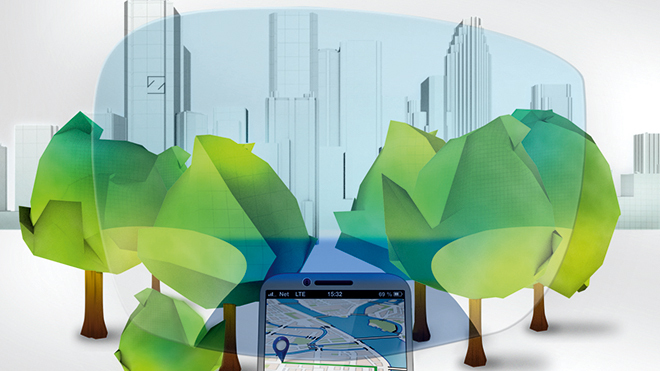 It is literally just a lens designed to help you get through your average day in 2014 (and the foreseeable future unless Google Glass starts really taking off) where we need to see not just in the distance, but transition clearly and easily back and forth between our digital world and the real world. I am not a spokesperson for Zeiss and was not compensated in any way to write this post.